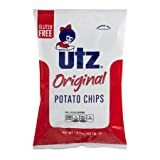 Utz Barbeque Potato Stix Shoestring Potato Snacks. This is a gluten free product. It has 0g trans fat. This product is made from fresh potatoes.